Marine Drive and the “Rio” treat ! I know it has been a long time since I last blogged. and of course, I shouldn’t feel good about calling me a “blogger” after doing only 2 posts in 2 years ! But, my plans to sit an write/type a blog-post have been spoiled by various reasons; the main reason being – “laziness” !!! The ‘big’ cup of ‘Rio’ ice-cream ! Worth the try, money and hype ! They seem to be having a branch-of-a-sort in Negombo. An an “Ice-cream van” from the “Negombo Rio” pays visit to the Marine Drive in Wellawatte daily ! And that sums-up the story ! 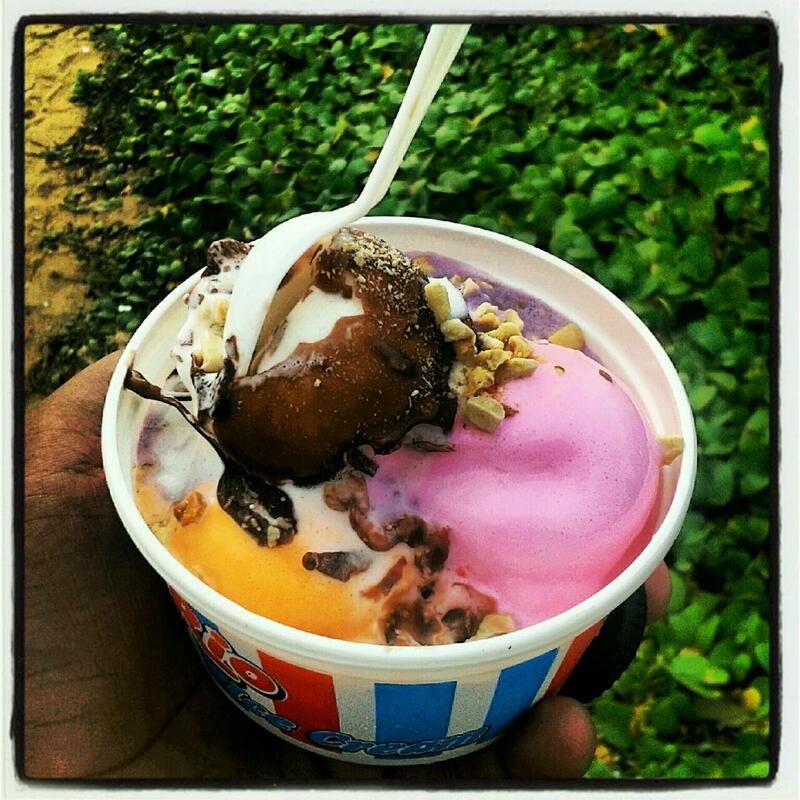 Sri Lanka, being a country with a usually ‘hot’ weather, has more ice-cream lovers (including me, of course !). And we’ve got our own experiences of having ice-cream at restaurants (and blaming them for overcharging after giving a scoop of Elephant House ice-cream !) and from those wayside sellers (during school days, mostly). Coming back to the “Rio” hype, I paid a visit to the Marine drive recently, to taste some ice-cream. The vehicle is parked by the railway tracks on Marine drive, few meters away from the Dinemore restaurant, towards Bambalapity. they had cups in varying sizes and since the Blueberry flavor which I wanted was available only in their ‘bigger’ cup of multiple flavors, I opted for it. It cost me Rs.100 (I repeat, ‘big’ cup with ‘multiple flavors’). I must say that i did not get disappointed. it was worth my visit, money and the hype !